It tells you something of our benighted age that histories of central banking are suddenly rife, from Liquat Ahamed’s Lords of Finance: The Bankers Who Broke the World to Neil Irwin’s recent The Alchemists: Three Central Bankers and a World on Fire. 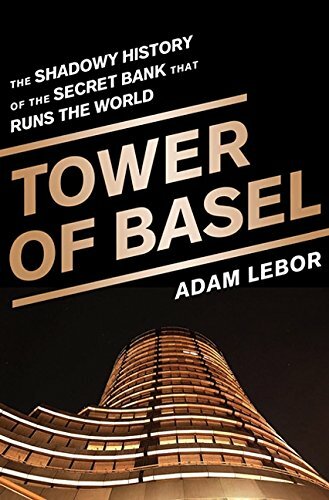 Now we have Tower of Basel by Adam Lebor, a clever title with a slightly overstated subtitle: The Shadowy History of the Secret Bank that Runs the World. This is a history of the Bank for International Settlements, an institution based in Basel, Switzerland. It is true: the BIS, even to many bankers, is shadowy, engaged in technical matters like payment systems and central banking coordination. If it is running the world; however, it is doing a lousy job at it. Central banking is undergoing a period of crisis. Central banking gods like Alan Greenspan have crashed to earth. Central bankers find themselves uncertain about their missions, forced into the public eye by the fecklessness of politicians and their own failures. The traditional role of central bankers—technocrats in an age of democracy—has grown ever-more precarious. As for the BIS, while it’s an important institution in central banking, it often resembles a conference center more than a bank. It’s where central bankers go to discuss matters like capital levels—something of a mess despite Basel I, II, and now III. Apparently the food and wine are excellent. There’s something Oz-like about it. The BIS produces research, collects data, exerts some influence (particularly in Europe), and plays a role in keeping payments systems working. But it is today—and always has been, as Mr. Lebor points out—more an instrument of central banks and of central bankers than an independent entity. The BIS, in fact, has long been an institution in search of a mission. It was founded in 1930 to manage the machinery of World War I reparations, a mission that quickly evaporated when Hitler refused to pay. It almost died during the war, then revived with postwar reconstruction and globalization. According to Mr. Lebor, two of its most important founders—the Bank of England’s Montagu Norman and the German Reichbank’s Hjalmar Schacht—secretly saw it as a haven for central bankers to privately consult. Switzerland was neutral and Basel sat near both the German and French borders. From the start, the BIS was given sovereign powers by Switzerland; it was, in fact, a tiny nation unto itself, as it is today. Mr. Lebor finds most of this not only unsatisfying but sinister. He seems to view nearly everything about central banking as a threat to democracy. The history of the BIS, particularly in the 30s and 40s, offers him plenty of ammo. The BIS was always close to the Reichsbank, not surprising given the geography. Its original mission meant it managed payments for Germany. Schacht and his successors under Hitler had great influence over the BIS, including three Americans who ran it early on: Gates McGarrah, Leon Fraser, and Thomas McKittrick (the Fed in those years could not be a shareholder under U.S. law, with the U.S. stake held instead by major U.S. banks and insurers; that didn’t change until 1993), which Hitler exploited. Mr. Lebor has amassed any number of ugly charges that swirled around the BIS in those years. Some of these undoubtedly stick. But a whiff of a conspiracy fixation hangs over the scene. Mr. Lebor clearly loathes nearly anyone associated with the BIS in those years. He sees dubious ties everywhere. The BIS in those years resembles some precursor to the Trilateral Commission, dominated by unrepentant Germans and WASP lawyers in New York, like John Foster and Allen Dulles (of OSS and CIA fame), John McCloy, Averill Harriman and Eugene Black. Beneath Mr. Lebor’s disdain lurks ambiguity and complexity. McKittrick, who ran the BIS during World War II, was a man in the middle: an American heading a Swiss meta-bank in the shadow of Nazi Germany. To save the BIS, he cooperates with the Nazis by accepting looted gold for safekeeping, then politely shipping it back. But he also seems to have informed on Germany with Allen Dulles. McKittrick embraced the impossible BIS ideal of a central banking Internationale independent of politics. He was morally pliable. But he was hardly alone and the moral challenge of those years was extreme. Mr. Lebor has no patience for mixed loyalties. But he also has no patience for human fallibility, unlike Ahamed in Lords of Finance. Mr. Lebor tells a surprisingly exciting story about a mysterious institution, but his characters rarely rise above cartoons. Nearly everyone is a Nazi or a pro-Nazi. He cheers Harry Dexter White of the U.S. Treasury for trying to kill the BIS at Bretton Woods, but then notes in passing that he also spied for the Soviet Union, excusing the same duplicity he condemns in McKittrick. The felt need to rebuild Europe quickly after the war as a bulwark against the Soviets is offered as a smokescreen masking private power and profits. Mr. Lebor seems to favor reducing postwar Germany to farms and forests. He blames U.S. aid—the Marshall Plan!—for European integration, which, he argues, was born with the Nazis. In the last third of the book, Mr. Lebor’s argument wobbles. He often seems to admire this odd institution in its modern garb. He dwells on its new headquarters. He wanders off to discourse on European integration, and the European Central Bank. Is the BIS a secret power? If so, it disguises it well. True, it is a striking monument to the technocratic mindset. But is it an instrument of power or does it possess power itself? Is an airport VIP lounge a power center because the powerful pass through it? It is true that BIS bureaucrats have been influential: Alexandre Lamfalussey was a general manager of the BIS and became the architect of the single currency, though I’m not quite sure how Mr. Lebor can describe the BIS, which isn’t a central bank but serves central banks, as the parent of the ECB (the German Bundesbank is the real parent). All-powerful or powerless? Oz indeed. Robert Teitelman was the founding editor-in-chief of The Deal and a former editor of Institutional Investor magazine. He is also the author of two books Gene Dreams: Wall Street, Academia and the Rise of Biotechnology and Profits of Science: The American Marriage of Science and technology.